Here's how I remove the nicks from the 1/60 SF-3A Lancer II project that I'm working on. 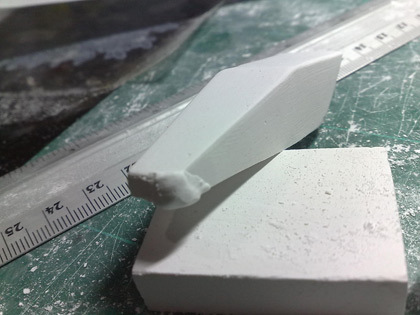 On this project I'm using plaster of paris as my working medium. On the areas where there are huge nicks and scratches, I just re-mix a small solution of plaster of paris then dab it on to the area. Curing time of plaster of paris is usually 45 min, so I wait an hour before working on that part again. Adding salt to the mixture can decrease the curing time to just 10 minutes, but since I'm in no rush I don't put any salt in it. I prefer to use a file or sand paper when I work on the patch to return it to its shape. That's because if I use a chisel I run a huge risk of snapping the patch off, or even worse an even larger chunk of the model that I'm working on. A better way to solve this problem is to actually reduce the incidences of me scratching or nicking the model. 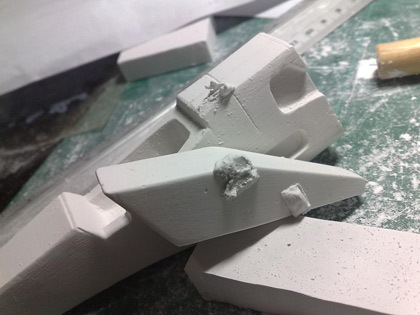 For me, this usually happens when I'm using the chisel in a confined space of the model which forces me to use greater force. I think the solution for this would be to get a battery operated dremel so that I can reduce the occurence of damage when the chisel slips from my hand. Another reason why I damage the part is when it slips out of my hand and falls. Usually onto a hard surface like the desk or the floor. Its not so easy to work with parts that one can barely hold in their hand. I think this can be solved by working on a soft mat that the part can bounce off of. And that's how I repair damages to the plaster of paris. Of course the final model will be cast to make a more permanent resin model.